Image classification has advanced significantly in recent years with the availability of large-scale image sets. However, fine-grained classification remains a major challenge due to the annotation cost of large number of fine-grained categories. In this work, we show that compelling classification performance can be achieved on such categories even without labeled training data. Given image and class embeddings, we learn a compatibility function such that matching embeddings are assigned a higher score than mismatching ones; zero-shot classification of an image proceeds by finding the label yielding the highest joint compatibility score. 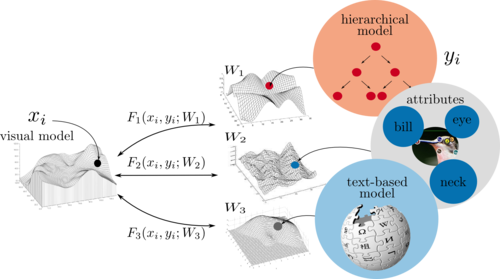 We use state-of-the-art image features and focus on different supervised attributes and unsupervised output embeddings either derived from hierarchies or learned from unlabeled text corpora. We establish a substantially improved state-of-the-art with continuous attributes on the Animals with Attributes and Caltech-UCSD Birds datasets. Most encouragingly, we demonstrate that purely unsupervised output embeddings (learned from Wikipedia and improved with fine-grained text) achieve compelling results, even outperforming the supervised state-of-the-art. Moreover, by systematically combining different output embeddings, we further improve results. Download Structured Joint Embedding (SJE) code and the data. GoogleNet features.